Kaiwarra Township, c.1897. Image from The Cyclopedia of New Zealand (vol 1), Cyclopedia Company, Wellington, 1897, p. 810. The Onslow Borough Council was formed in 1890 with the merger of the townships of Kaiwharawhara (then commonly known as Kaiwarra), Khandallah, Wadestown and Ngaio (then called Crofton). These areas had previously been under the control of the Hutt County Council - an enormous, predominantly rural local authority. When it formed in 1876, the Hutt County Council covered the entire Wellington region (excluding the original boundaries of Wellington City which only stretched from Thorndon to Newtown) to the top of the Hutt Valley on the east and up to Kapiti on the west. Kaiwharawhara had been given a degree of independence within the Hutt County Council when a local Town Board was elected in 1881. One of the main reasons these areas lobbied to break away and create the new Onslow Borough was the resentment many residents felt towards a toll-gate which had been established by the Hutt County Council on the Hutt Road at Kaiwharawhara. This imposed a toll of 1 shilling on all vehicular traffic entering or leaving Wellington (the equivalent of a charge of about $5 today) with saddled horses being charged half that rate. This was a major revenue stream for the Hutt County but much of this money was spent on distant road improvements that provided no benefit to those living closer to Wellington. There was some debate as to which areas should be within the Onslow Borough with some opposition from the residents of Wadestown and Johnsonville to joining. 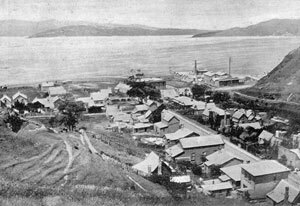 While Wadestown eventually did so (it left the Onslow Borough and became part of Wellington City in 1907), Johnsonville remained a quasi-independent board within Hutt County until it too became a fully independent council with its own mayor in 1906. It amalgamated with Wellington City in 1953. The creation of the Onslow Borough marked the start of the transition of much of the area from rural to outer-suburban. Though vehicular access to the upper suburbs was difficult, the area was serviced by the rail line running up the Ngaio Gorge which opened in 1885. Once most of the native bush had been milled for timber, land subdivision began and developers began to build residential properties in Ngaio and Khandallah for Wellington's expanding middle-class population. Much of this development was in sharp distinction to the Kaiwarra township which reflected the class divisions within the borough. Located around the area where the Ngaio Gorge road intersects the Hutt Road, some 500 people lived crammed into small cheaply built houses which spread up the surrounding hillsides. Many of the adult men were employed in local factories which belched smoke and putrid odours over the area. Industries included soap, candle & glue manufacture, leather tanning and fellmongery (i.e. animal slaughter). These were trades which had gradually been declared 'offensive' by the Wellington City Council and so were pushed outside the city's limits to Kaiwharawhara. it really ought to be. Though the Borough Council helped advance the Onslow area by improving infrastructure in areas such as road building, telephone cabling & street lighting, and the construction of community facilities such as a swimming pool and a Town Hall, development still lagged. Recognising that real growth was unlikely to occur without a big injection of capital (or incurring massive debt), the Onslow Borough Council came to the inevitable conclusion that it was too small to prosper as an independent local authority. A referendum was held on an amalgamation proposal which citizens agreed to support. After a final meeting held on 31st March 1919, the Onslow Borough Council dissolved itself after nearly 30 years of independence. The following day the area formally became part of Wellington City.